US President George W Bush engaged in high-stakes talks Thursday with Chinese President Hu Jintao, the leader of one of the world's fastest-growing economies and one of its most formidable military powers. Bush said before the session that he would express both encouragement and concern to Hu. The two leaders, meeting on the sidelines of an Asia-Pacific economic summit, were expected to talk about an hour. Bush and his aides said he was eager to talk to Hu about increasing trade and climate controls and to express satisfaction with Beijing's role in pressing North Korea to agree to disavow nuclear weapons. But he was also ready to discuss product-safety issues following a rash of recalls in the United States, and to register his worries about China's exchange rate policies. Bush was to urge the Chinese leader to be more aggressive on Iran, raise the issue of jailed dissidents, press Hu on the humanitarian crisis in Darfur and on the treatment of the Dalai Lama, administration officials said. He may even bring up unsubstantiated reports that China's military has hacked into Pentagon computers. 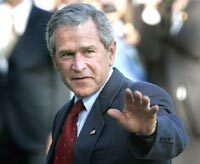 "Our relationship with China is complex," Bush said Wednesday. "We still have got a huge trade deficit with China, which then causes us to want to work with them to adjust - to let their currency float," Bush said. "We think that would be helpful in terms of adjusting trade balances." Dan Price, a presidential international economic adviser, said "a whole range of economic issues, bilateral issues with China, are obviously on the table, and would naturally be subjects of discussion between the two presidents." Exchange rates are "a very important issue" to both countries, he said. Analysts say China's yuan is undervalued, giving Chinese exporters an unfair advantage despite China's steps to revalue the currency by 2.1 percent in 2005 and then letting it appreciate a further 7.3 percent. U.S.-Chinese tensions have also grown over the issue of defective products. Just Wednesday, Mattel Inc. announced a third major recall of Chinese-made toys in little more than a month because of excessive amounts of lead paint. The world's largest toy maker said the move affects about 800,000 toys. China has denied reports that its military hacked into a computer system in the office of Defense Secretary Robert Gates in June. Bush largely sidestepped the question, but said, "We understand that we're vulnerable in some systems." The Financial Times, citing unidentified officials, said China was behind the attack that forced the Pentagon to temporarily take down the network. China has called the allegations "groundless."